Image courtesy of the Halton Environment Network (HEN). It’s that time of year! The holidays are fast approaching and the Halton Environment Network (HEN) want to make it easier for you to remain low-impact in this busy time! There’s nothing better than bringing family together to share food and gifts, but we do want to be mindful and ensure that our gifts leave a positive impact for everyone, especially the planet. Follow these easy tips to help reduce your impact on the environment while still being gracious! Also, we’re sure that you’ll save more than just landfill waste when you follow HEN’s Graciously Green Guide – get excited to save money, time and the hassle of shopping in complete chaos! Forget the fake stuff and opt for natural alternatives when it comes to decorating. Remember stringing cranberries and popcorn for a little festive fun? Try these great ideas to make your house ready for the season without having the garbage left over (or taking up space in the basement). Plan a holiday craft party and bring some nature indoors, and invest in a real potted tree that can provide freshness all year! Have a group of friends, family or colleagues to shop for? Organize a Holiday Gift Swap so you can focus on quality and not quantity. Here’s some help organizing your gift-swap! 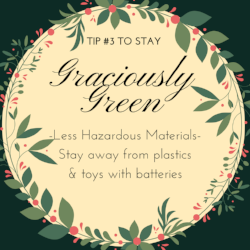 If you are purchasing gifts, especially for young ones, try looking for products that are plastic free, and do not require batteries. Check out Simply Green Baby in Oakville for great eco-friendly alternatives that are both fun and educational! Purchasing goods from local businesses not only reduces the carbon footprint of your gifts, but also helps to support artisans who care about their products and the planet. Check out Burlington Made Market on Dec. 9 to find unique, well-made gifts for the whole family. Don’t skip the lights this year – become aware of how much energy your lights are actually using by using this useful calculator! Check out other options, such as LED lights, and remember to set a timer to shut off the lights overnight! Let’s eliminate the need to buy wrapping materials by getting creative with our gifts. Whether its checking out BurlingtonGreen’s Gift Wrap at MEC Burlington, or joining HEN for it’s Zero-Waste Wrapping Workshop on Dec. 12 at QEPCCC, 2302 Bridge Rd. in Oakville from 10am-4pm.! Surprise your loved ones with the gift of experiences, adventures and quality time. Conservation Halton has a great Holiday Gift Guide for inspiration, or check out whats happening at the Royal Botanical Gardens. Celebrate giving and give back to the environment by planting a tree with Oakvillegreen Conservation Association. Look for products that were made from ethical sources, with fair-trade standards so everyone can have a happy holiday this year. Invest in quality products that last, such as the great selection from Ten Thousand Villages in Oakville. Now we’re referring to the products that you’re using to get ready for holiday parties – get glamorous without toxic products and celebrate natural beauty! Check out this great guide to make natural make-up alternatives, which can also make fantastic gifts! Now while this refers to everything we consume, there’s mountains of food waste that follow our dinner parties. 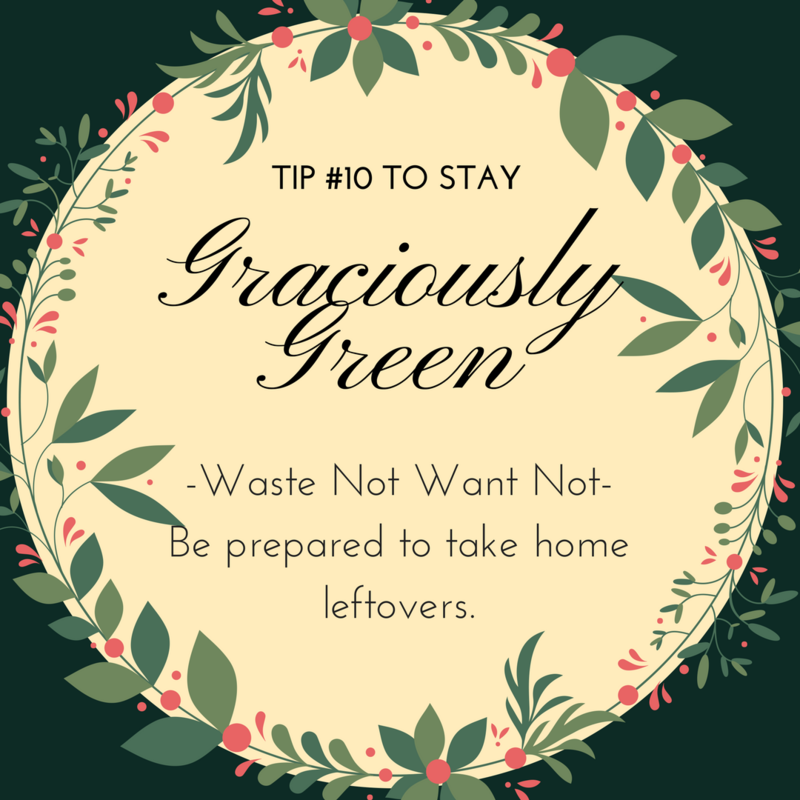 Be mindful in preparing smaller amounts for your guests, or by being prepared to take home the leftovers. Come equipped with large, versatile containers and leave knowing your cooking has not gone to waste! Follow HEN on Facebook, Twitter and Instagram to catch more tips this holiday season. 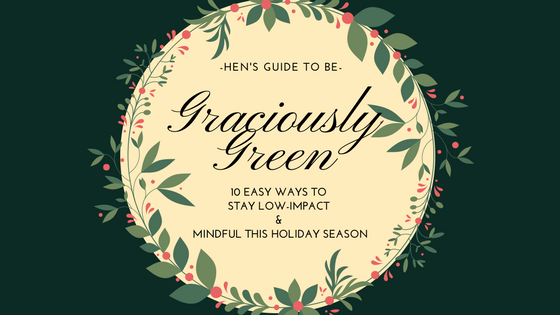 HEN would love to hear your success stories, tag #GraciouslyGreen to share your dedication to staying low-impact! Above all else, we’d like to take this time to remind our readers the importance of our individual action. We all have a part to play in reducing our consumption, and a personal motivation to leave behind a healthy planet. So try your best! And let HEN know if you need help or motivation along the way. The holidays are a perfect time to show others how easy it is (and fun!) it can be to try more eco-friendly alternatives. So HEN encourages you to try this out for yourself, and share these tips to friends & family that might need some help going green. This post was printed with permission from the Halton Environment Network (HEN). Take Action Burlington! Collectively we can make a difference.